I was given the opportunity to review this awesome kinesiology tape by Ape Tape. My photos of me actually using it are below, and excuse my crazy shoes, I was wearing my work attire. 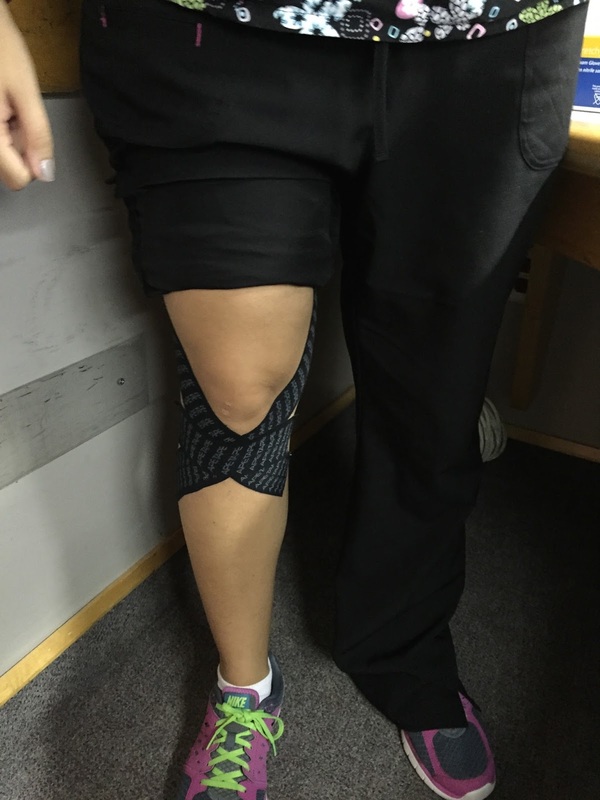 :) I have posted about other kinesiology tapes previously and I hope you enjoy this one as well! The Ape Tape comes in a 2 inch or 4 inch wide, continuous not precut roll. It comes in three colors, black, orange, and sky blue. 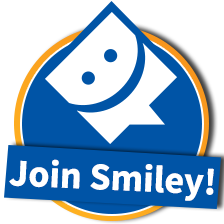 It can be a little more difficult to use because it is not precut but with a little bit of practice, you can learn how much you need very quickly and easily. In case you have never heard of or used kinesiology tape before, it is a tape used for pain relief, injury recovery, and increased circulation or lymphatic drainage to an area. It is more common among athletes but I have used it on physical therapy patients after an injury at home with much relief. 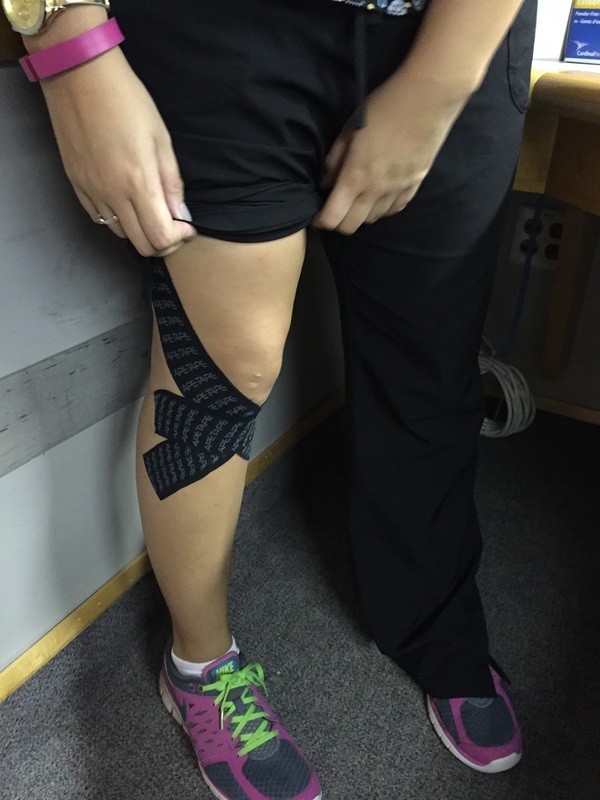 The tape can also assist with soreness, tension, or cramping. Kinesiology tape is always my go to before a long run, after any sort of extensive weight lifting session, or after being on my feet so much at work. Tape could easily be used for anyone who loves to bike, run, walk, work a lot on their feet, cross fit, weight lifting, dance, or even someone working in an office with carpal tunnel. There are many different ways to tape and various techniques. I always youtube how to tape body part here because each spot has a different way to tape. I placed the Ape Tape for my runners knee which I have been suffering from for some time but always find relief with kinesiology tape. The application was simple, I cut my own strips and placed it with the amount of tension I needed. I walked my usually 4 miles at work that night with minimal peeling. After my shower, I noted that it did peel a little bit more than other brands have and don't think I would recommend this tape for swimming even though I think it would last for at least the swim. The brand Ape Tape says that it should last a maximum of 3 days with sweating, swimming, and showering, but I don't think it would last all 3 days if used while swimming. However, I don't swim much so I cannot offer much help with that part of the review. Overall, I did enjoy the Ape Tape. I did find comfort and did not find myself taking any pain relievers during my shift at work. I have to admit that the ends did start to peel quickly my shower but I usually change my tape after showers anyway so I didn't find it to be a problem. Since I have only used it for my knee, I cannot review how it helps other joints like hips, wrists, ribs, elbows, etc but I hope that it provides as much comfort there as it did to my knee. 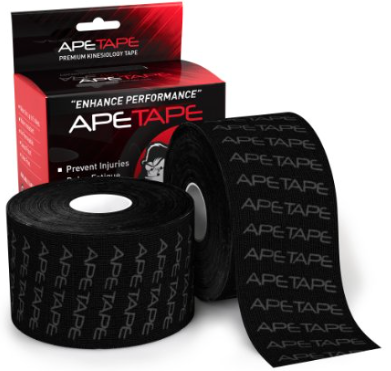 If you are interested in purchasing Ape Tape, check out their Amazon page here. I was given this product in return for an honest review.